Was away camping on the weekend - just car camping. Chucked stuff in the car, got to campsite. When I opened up the cooking gear the lighter in there was corroded solid. It had got wet when I was out last, a month or two back, but wasn't sitting in water. What can I get that doesn't rust up at a drop of water and is good for lighting meths, gas or wood fires? A firesteel will work well for meths and adequately for gas. Not much good for wood. Piezo-ignition gas lighter might be a bit more resilient than a flint one, but I wouldn't bet on it. My limited experience of waterproof matches has been disappointing. Rubbing two boy scouts together is traditional , but would probably get you put on a register. You would still need to make sure the inside is dry before closing it and putting it away, I would have thought. I do have a "capsule" lighter which keep on my key ring, which similarly is sealed; you have to unscrew it before using it. It runs off lighter fluid. Another type is the permanent match, if it's made from a rustproof material then it should still work if stored damp. I've bought a cheap one for 50p, the container is plastic, the "match" is metal. And then there's various methods of creating sparks, basically rubbing something hard against a ferrocerium "flint". 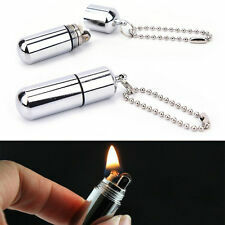 Best to have a 2 lighters if you really need a lighter to work. I picked up a turboflame lighter - it is a bit heavy but shouldn't break. It is just a lighter but uses piezoelectric rather that anything rotating to to corrode up. Will see. Tempted to get a firesteel thing as well to put on keyring. When camping weekend before last I was relighting my kelly kettle about 5-6 times a day to boil water for drinks and washing up so using a firesteel would have done my head in, particularly once I'd run out of the fine tinder I'd brought with me. Will a regular disposable lighter not do? Piezo electric lighters are nice, but they don't last forever. My experience with firesteels is that they don't work too well in sub freezing temperatures. Over the years cheap disposable lighters have proven to be about the best solution. I've got a box of them that I found in various places. I bring a couple on any camping trip (bicycles skis, walking), spread them around my gear in places that won't get wet, and test them before every trip. My usual kit is a firesteel for lighting meths (where it's genuinely the most convenient) and a disposable lighter or two (best for everything else) as a backup. Posh barakta-friendly gas lighter for the car-camping stove. ... My experience with firesteels is that they don't work too well in sub freezing temperatures. In cold==close to zeroC temperatures I get firesteel to work by warning the meths in a small 30/60ml Nalgene bottle in my pocket. But I always carry matches as a spare. Yeah. Firesteel works fine in the cold, it's the meths that needs some encouragement. Butane, of course, requires even more encouragement. it's the meths that needs some encouragement. If I remember, I screw the lid on to the Meths burner, pop it into the yellow bag and then into the sleeping bag with me.